Q: Could you speak about your family and your background? Did it have an influence on your politicisation? A: My family is from the Islands, Nainativu and Analaitivu and my father was a clerical servant in the Education Department. As a small boy, my family stayed with the Poobalasingam family in Kottati, Jaffna. He of course started the famous Poobalasingham Bookshop and was a Communist leader of Nainativu. My uncle Rajendran, was also a committed Communist. My mother’s father, a Station Master, had died before I was born, but he left a good collection of books in Tamil and English. There were pictures of Nehru and Gandhi in our house. We had a copy of the Discovery of India by Nehru and the ten volumes of the Book of Knowledge. Then there were old Tamil books of Bharathy and then, Mahabaharatham and Ramayanam. When my father was working in Colombo, he used to send a package of newspapers and magazines every week by post. So, I was surrounded by books growing up and eventually read widely, and that had a great influence on me. When I was in grade 7, we moved back to Jaffna from the Islands and I went to Jaffna Hindu College. At my A/L, I was politically conscious. I remember the protest march against the Republican Constitution of 1972 and the tense situation in Jaffna. I went to the World Tamil Research Conference in 1974, but I was not there on the last day that ended in the massacre. I remember how the police acted in Jaffna around the riots of 1977, I saw them pour kerosene and burn the New Market. So, I was influenced by the rising wave of Tamil nationalism. Q: Your political life, as with many other pioneers of Tamil militancy, began as a youth activist in the late 1970s. What was the political setting and the intellectual influences during the crucial years from the late 1970s into the early 1980s? A: I must truthfully say, we were critical of the traditional left. We did not accept their solution, and were critical of their alliance with communal forces. We also did not believe in parliamentary politics, which we thought was compromised. There were two major influences at that time, one was the JVP uprising and the other was the separation of Bangladesh. So we believed an armed struggle was possible and that a country can be separated. To be honest, we were trying to argue for separation, and for that reason looked at theories like the Right to Self Determination. So we read about the struggle in East Timor, Mindanao and the Basque country in Spain. There were many debates going on between the Communists like Shanmugathasan and the Tamil nationalists. Jaffna was politically and intellectually very active during the 1970s and 1980s. I did not pursue studies after my A/L, but there were many local intellectuals who influenced me. We ourselves as youth started many magazines. There was Kailasapathy, A. J. Kanagaratna, Indrapala, Silan, Nuhman and Sivathamby at the University. There were also younger lecturers and students such as Nirmala, Nithiyandan, Chitralekha, Maunaguru, Varatharajaperumal, Somesasundary, Selvyn, Jeyapalan and Cheran. Outside the university those linked to the various left parties including Visuvananthathevan, Annamalai, Para, Thevarajah, Sinna Bala and there was Maniam’s bookshop for discussions and Senthivel and their party. People like Kethesh Loganathan were supportive of us and introduced us to people who came in solidarity from the South including Vasu, Ananda Vakkumbura, Newton, Upali, Dayan, Sunila, Pulsara, Joe, from the Left parties and the Movement for Inter Racial Justice and Equality (MIRJE). We were also invited for seminars and discussions in the South. Some people ran study groups for us and others challenged us to think about Maoism. There were political films shown at Trimmer Hall. We were absorbed by those times and believed revolution was possible. Q: How did you get involved with Tamil militancy? A: In 1977, the Eelam Revolutionary Organisation of Students (EROS) had been initiated in London by Ratnasabathy and Arular. And they also created the General Union of Eelam Students (GUES). They made links with other struggles around the world, including with the Palestinian, African and other national liberation movements and wanted to think of the Tamil struggle in internationalist terms. They had started a training camp in the Vanni, but with the Bastiampillai incident, when a few policemen were killed in the Vanni by the LTTE in 1978, all the camps in the Vanni were raided. Those who had come from London for the discussions managed to leave. But that raised the question whether the leadership should be in London or here in Jaffna or in India. In August 1980, about 15 of us met in Tamil Nadu for an organisers’ conference led by Pathmanabha. We went to Keerimalai, as if we were there for a swim and then the fishermen smuggled us to India. It was a just a few hours by boat to India. At that conference, we formed the Eelam People’s Revolutionary Liberation Front (EPRLF) as a secret organisation. We decided that only the front organisations will surface, and I was put in charge of GUES. GUES did a lot of work as the youth were interested. We started organising study groups in schools. Pathamanabha felt we had to work with the oppressed caste communities and recruit them into our struggle. A lot of women also joined our women’s wing. My wife and comrade, Gnana, joined the movement in 1981. Jaffna society did not like us, because women and oppressed caste youth were moving freely with our movement. We would travel long distances to meet activists working on issues. People were very receptive to us in the East. Many Muslim comrades also joined us. We worked with trade unions village workers union, co-operative union and some of the other left parties and united around many struggles. We organised a massive May Day rally numbering over a thousand people at Muthaveli in Jaffna. We did a major campaign against JR’s referendum of 1982. There were also tensions within the Tamil community and Tamil militants. We strongly condemned the murder of Suntharam by the LTTE in 1981. And then there was the caste murder of bus driver Annasamy in Punnalaikatuwanin 1982, which we protested. We did many massive poster campaigns on all these issues. Q: The July 1983 riots escalated the armed struggle, how did it influence EPRLF and your work? A: After July 1983, boat loads of youth joined all the militant movements and we also set up training camps in India. But we could not carry out serious political education after that. We tried to have classes in the camps, but that is different from political education that comes with working with people on the ground. I think that was a huge setback for us. On June 5, 1984, some of us had gone to a boat-driving comrade’s house in Myliddy for a meeting, and the army surrounded that house and arrested us. I was severely tortured. I thought I won’t come out alive. I was eventually moved to Welikada prison, where the situation was very different. The Tamil prisoners there were organised, we held political classes and there were even Karate classes! We prepared ourselves, in case there was a prison massacre like in 1983. We had many struggles for better prison conditions and food. We even managed to listen to the radio for news. The lawyers who argued my case and kept my family informed were Francis Xavier, Kumar Ponnambalam and Joe Jeyaratnam. I was released on December 19, 1986. By the time I was released, everything had changed. The LTTE had massacred TELO in April 1986, and followed with banning PLOTE, NLFT and PLFT. A week before I was released, they attacked EPRLF and banned it. By 1986, we were convinced that Tamil Eelam was not possible. We realised that separation was not possible with the Thimpu talks and India’s position. Q: In 1987, with the Indo-Lanka Accord, EPRLF gained control of the North-East Provincial Council (PC). What was EPRLF’s role during and after its stint in power, and how did it influence your political thinking? A: We had committed PC members and officials, including people like Varatharajaperumal, Sivarajah, Sivathasan, Pathmanathan, Nachinarkiniyan and Vigneswaran attempting to make the PC system work. But with little support from the Government, it was a very difficult. Subathiran, who was released with the Accord, and I wanted to again work with the people. These were tough times. Some of our cadres were very bitter about how the LTTE had attacked them. And there were many abuses by our side as well. We have done a lot of self-criticism about that period. I am now aware of the dangers of armed struggle, how it brutalises a movement. Now, I believe, we should only consider non-violent mass struggles. When the Indian army withdrew, we also had to leave for India. Tamil Nadu did not want to accept the retreating EPRLF cadres and families, and the ship landed in Orissa. Our cadres had a very difficult time. Then in 1990, Pathmanabha and 12 others were massacred by the LTTE in Chennai. Q: With the EPRLF crippled, how did you see your role? A: When the Chandrika government came to power and the UNP government finally fell after 17 years, we felt there was an opening. Subathiran and I decided to try and work again, to keep some democratic space open in Jaffna. In 1997, we returned to Jaffna on the same flight with Mrs. Yogeswaran. As mayor, she wanted to work with everyone, until she too was killed by the LTTE. Subathiran worked hard and created many connections in Jaffna. 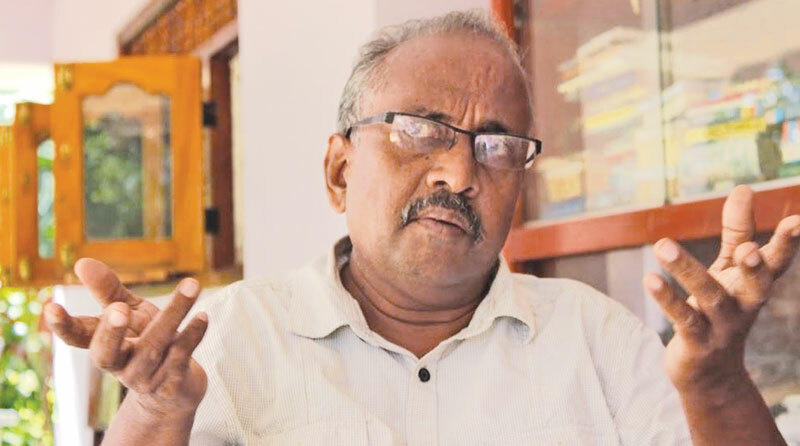 Raviraj was in Jaffna, and Anandasangaree with Mayor Kandiah tried to open the Jaffna Public Library despite the LTTE’s threats. People from the South again came and visited Jaffna during the peace process in early 2000. But the killings started again, and Subathiran was murdered in 2003. I think we as a movement have made many sacrifices, and we have also influenced many people. We have left a certain thinking on some issues in the North, particularly in oppressed caste villages. But movements have their time and moment, and that also passes. Q: The LTTE’s demise in May 2009 ended a destructive and tragic period for Tamils and politics. Why is it, that 8 years after the war and the democratic opening, progressive politics is lacking and Tamil nationalist politics is dominating? A: Yes, I think a lot about that. After all the losses, so many who lost their lives, our Tamil society continues like nothing happened. We have to research and try and understand the reasons for this situation, and take forward a different politics. To start with, democracy is still lacking in our society and in our relationship to the state. If an ordinary person goes to the Kachcheri, they are almost scared to go in. The officials here act like feudal lords. There is little hope for a political solution now. There are few leftists in the South with whom we can discuss our issues. And people in the villages are in a very difficult economic situation. The state wants to crack down on those selling Kassippu and sand in some backward villages, but the sad reality is that, among some communities, if they don’t do that, they have no other income. The economy is failing the people, and the Central Government and even the Provincial Government don’t seem to have any solution other than using the police. Anti-Muslim feelings are being cultivated, and even after their eviction and suffering, they are still not accepted by Jaffna society. Caste thinking is strengthening. In the villages, the roads, electricity and all of the state services, often stop just where the oppressed caste part of the village begins. Those of us who come from a left background, even if we are fractured, there are hundreds of people here with such left thinking, and we need to come together. We have to continue to work for democracy, social justice and reconciliation. I may ignorant of these happenings but it reflect our politicians character and their role during these times just leaving the responsibilities to army tv and police all with high degree of less education calibre most behaving with ignorance malice just to keep up with each other's stupidity burning looting killing while politicians buying arms some in power get sidekicks of gas as we were informed by some media in reports who knows what many evil deeds happened. Cover up corrupt lies ignorance. What our society st large with years of Buddhist teachings role of sanga etc. Pity the souls suffered all many years.